A Yoga Wilderness Weekend. Nizina River Raft Retreat. Practice yoga in the stillness of nature. Raft the spectacular Nizina River in the Wrangell St. Elias National Park and Preserve. Class II and III whitewater makes this a must do Alaskan river adventure. Away from the crowds and the comforts of civilization-while enjoying wilderness rafting in America’s largest National Park: Wrangell St. Elias. This 6 day trip includes daily yoga asana, pranayama, meditation. We’ll be rafting through spectacular terrain. We savor time time for reflection, rest and renewal on the lake, mountains & glaciers. Nourishment? you’ll love our healthy and delicious Ayurveda inspired meals and snacks. Enliven your spirit and connect with nature. 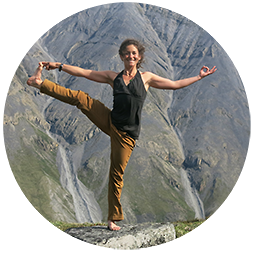 Practice yoga and meditation in Alaskan wilderness. Trip Highlights Yoga practice and meditation, hiking, rafting Nizina River, wilderness, camping. A yogi since 2009, I began teaching in 2012 after studying in India and has 500 hrs of training with the Yoga Alliance. I’ve studied and practiced Ashtanga, Hatha and Kundalini, but my preference is to “teach to the room”. My teaching style utilizes mindful movement with breath and postural awareness. I am also an Ayurvedic Health Counselor with the National Association of Ayurvedic Medicine. My bio is here and my website is Ayurveda Mind Body. The Nizina River, Wrangell – St. Elias National Park. The largest, wildest national park in the nation. The float down the Nizina River takes you through a fascinating, dynamic landscape. Nizina Lake, our access point, drains the outflow of the enormous Nizina Glacier. The River flows a tumultuous Class II and III whitewater section as it races down valley. We’ll see waterfalls and forests and the incredible Wrangell Mountains. The Mile Cliffs are always a highlight, towering limestone cliffs that hem our journey. Meet at 8am at Open Space Alaska in Anchorage. Here we enjoy our first yoga class together; expect to move, breathe & stretch the body while relaxing the mind. This will be an all-levels movement based practice with modifications for newer yogis and advanced options for more seasoned practitioners. After our yoga session, we will have a light snack and begin our journey towards McCarthy. The drive to McCarthy is about 7 hours; we’ll stop for lunch and a short 2 mile day hike near the Copper River along the way. That night we stay at the Kennicott River Lodge; we’ll have a fresh dinner delivered from a local food vendor. Wake up with an optional lakeside meditation and yoga practice before breakfast. We then pack our bags and head to the airstrip in McCarthy for our bush flight to Nizina Lake at the terminus of the Nizina Glacier. On our way, we’ll fly over some of America’s largest mountains, rivers and glaciers before landing and setting up our camp. After lunch, we’ll have a backcountry safety orientation and get settled into our camp. That afternoon we’ll raft around and explore the lake. Nizina lake is stunning with big icebergs, ice caves and possible wildlife spotting. If we feel up for it, we can hike and explore the other side of the lake. That evening we’ll conclude our day with a lakeside yoga/meditation practice followed by dinner around the campfire. We begin our river journey after some morning yoga and a nourishing breakfast. We’ll get up close and personal with ancient ice as your guides negotiate the icebergs in the lake, winding our way to the mouth of the Nizina River. Float past the Mile High Cliffs on the right and the mouth of the Chitistone River on the left; we’ll have ample time to take photos, hike or practice yoga along the way. That night we’ll camp right next to the river- letting the downstream sounds put us to sleep after our evening yoga/meditation practice, delicious dinner and campfire. After our morning practice and breakfast, we’ll pack up camp and float on downstream. The historic remnants of the Nizina River Bridge that once connected the towns of May Creek and McCarthy awaits, reminding us of the copper and gold rushes of the past century. This bridge was the only connection between these towns; only by boat can you now continue downstream through the windy walls of the two Nizina River Canyons and towards the Chitina River confluence. Your guides will row through the fun twists and turns of both the Upper Five Mile Gorge and the Lower Nizina River Canyon. With views upstream of the mighty 16,000-18,000 ft peaks in the St. Elias range- the tallest coastal mountain range in the world, this river is an Alaskan gem! After yoga and breakfast, we’ll get picked up by bush plane at the confluence of the Nizina and Chitna Rivers and fly back in McCarthy. After showers and relaxing, we’ll have an optional outing to visit the historic town of Kennicott. Located only 5 miles from McCarthy, it offers unparalleled views of the world’s 2nd largest icefall and the Historic Kennicott Copper Mine. That night we stay at Kennicott River Lodge. After our closing yoga practice and breakfast, we’ll pack up and say farewell to the Wrangell Mountains. We’ll stop for food and a short hike or yoga session to stretch our legs on the way back. We’ll arrive in Anchorage by 6pm. No. Yoga classes are “all-levels,” ages, and backgrounds suitable for both beginners and advanced students. Your teacher can help you accommodate the practice to your needs. Do I need hiking or paddling experience? Your guide will teach you everything you need to know. What sort of shape do I need to be in? This trip is relatively easy and relaxing, suitable for most fitness levels. Day hikes will be less than 3 miles. If you’d rather, yes. Please notify us in advance. Parking costs will not be covered for extra vehicles. Most likely. We want you to feel healthy and thrive on this trip! We have experience catering to dairy and nut allergies, gluten free diets and other food restrictions. Please notify us in advance so we can make a suitable meal plan for you. Please note there may be an additional fee to cover extra food expenses. What if I Have a Medical Condition/Concern? Please contact us directly to discuss further. We wouldn’t want this to stop your adventure necessarily, but want you to work with your doctor in making safe and healthy decisions for your well-being. Many providers will not work in McCarthy, it is best to check with them directly. It’s a great idea to bring it with you during transportation, but leave it behind once we fly into Nizina Lake. We want you to fully enjoy your natural surroundings and be present for your adventure. This is for you and other participants. Guide will have a means of communication in case of emergencies. McCarthy, AK is such a cool place. You’ll love it. Typically we’ll stay across the river from the small town of McCarthy in a small cabin or lodge. The lodge backs against Kennicott Glacier. The awesome Stairway Icefall sits just beyond. A 7000′ vertical wall of ice. So beyond the astonishing mountain views, McCarthy is a small rustic town in the heart of Wrangell – St. Elias National Park. Originally a feeder town to the nearby Kennicott Copper Mines, McCarthy is now the hub of the park. It’s a short 1/2 mile walk into town from Brad’s Lodge (Kennicott Glacier Cabins). We walk because the public bridge across the Kennicott River is a small bridge for foot traffic only. The vehicle will stay on the lodge side of the river. A 10 minute walk will pretty much cover the entire town. There are a couple of small air taxi services, a hotel and hostel, a bar/restaurant, a souvenir store and another newer eatery/bar called the Potato. Good food, fun folks, and a wonderful charming environment. A 5 mile jaunt up the road from McCarthy is Kennicott (there is a shuttle service available and included to get us up and back; or walk the wagon trail). In Kennicott you’re free to wander the town and look at the historic mill building (schedules private tours available), poke your head in the door of the various establishments (guide services, restaurant/lodge, stores, the National Park Service Visitor Center, etc). Just remember a lot of the buildings ARE private residences so don’t intrude. A couple of hiking trails out of Kennicott can take you out to the Kennicott Glacier or up to the old mines (Bonanza, Jumbo and Erie). An afternoon in Kennicott is a ton of fun and a great way to wind down after your backcountry expedition. If cancellation is within 30 days of the trip only 75% of the fee can be carried over to a future trip. No refunds are given for cancellations within 14 days of the trip departure. We all do. Questions are good. That’s how we learn. Either give me a call or send me an email and we’ll go through them. I also send out a comprehensive Trip Information Packet upon your reservation and that will usually answer your questions. Come experience the Alaska’s wilderness with us. Yoga in the Mountains. A Hike and Paddle Yoga Retreat Basecamp . Practice yoga surrounded by massive glaciers, rivers and mountains. Experience stillness. Explore your surroundings. This multi-sport base camp adventure combines the best ways to experience Alaska: we fly, paddle and hike! Each day starts and ends with a wilderness yoga and meditation practice. A Land of Ice and Rock. Mountains and Glaciers. And You. Welcome to Alaska's version of Antarctica! Enjoy an incredible backcountry flight, camp by a beautiful small alpine lake and explore the very end of the eastern Chugach Mountains. Plus another remarkable flight back to McCarthy. One week in the mountains. One lifetime of Wow. One of my favorite places in the world, Skolai Pass. 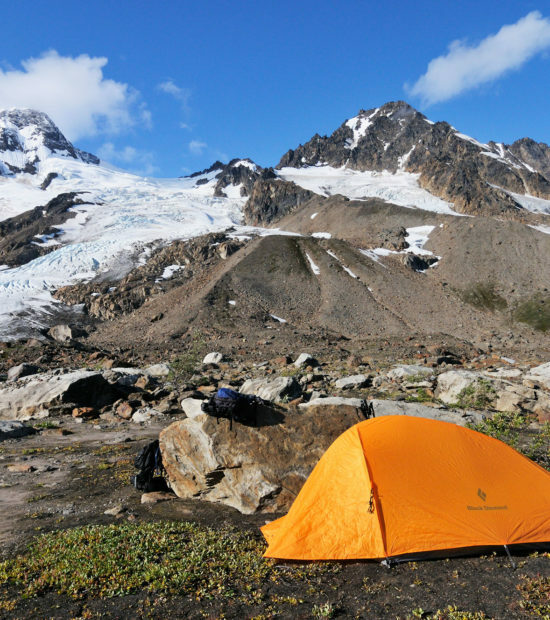 Camp beneath the rugged peaks of Hole in the Wall, hike the Russell Glacier and catch a glimpse of Mount Bona, 4th highest mountain in the country.